This is to state that some of my employees have misused my cell phones when i gave them the same for use during work. It is unfortunate that they have used the cell phones to send messages to themselves and their friends. This has been done on different occasions and at different times. Through this communication I wish to share with all concerned that the contents of the message is not known to me. This is a clear case of Breach of Trust. They have stopped coming to work. Besides they were responsible for registration; they collected monies and did not deposit the same with our accounts department. Consequently the organisation lost monies. We continue to pursue with clients to get additional information. 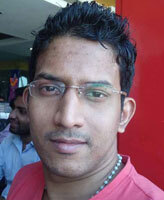 Mr. Sean Dsouza Joined the Company on 15th August 2012. He Stopped coming to Work from 10th April 2017. 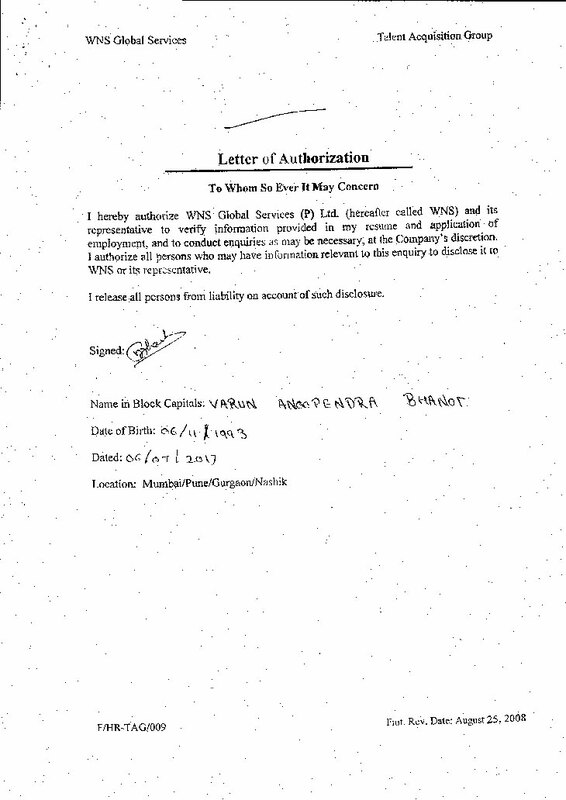 Neither has he handed over any material or company property which is in his possession. 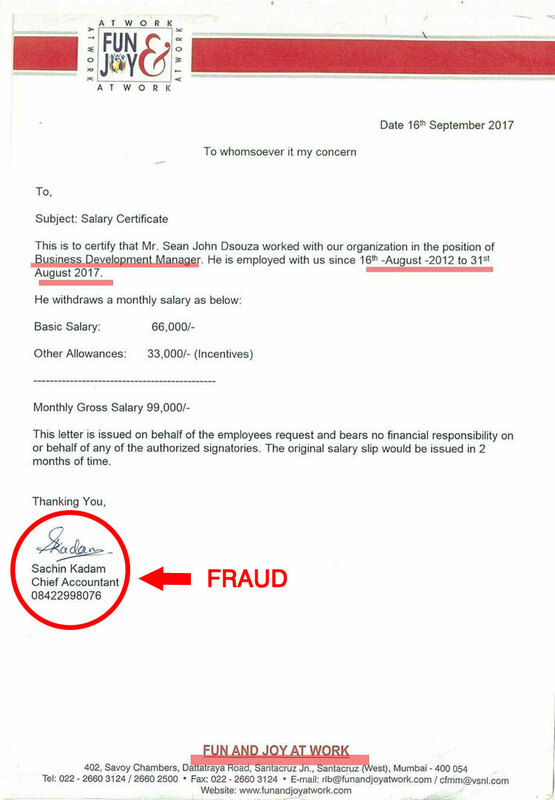 He had lied about his work and whereabouts and the Organisation has suffered a Financial Loss because of his actions and cheating. 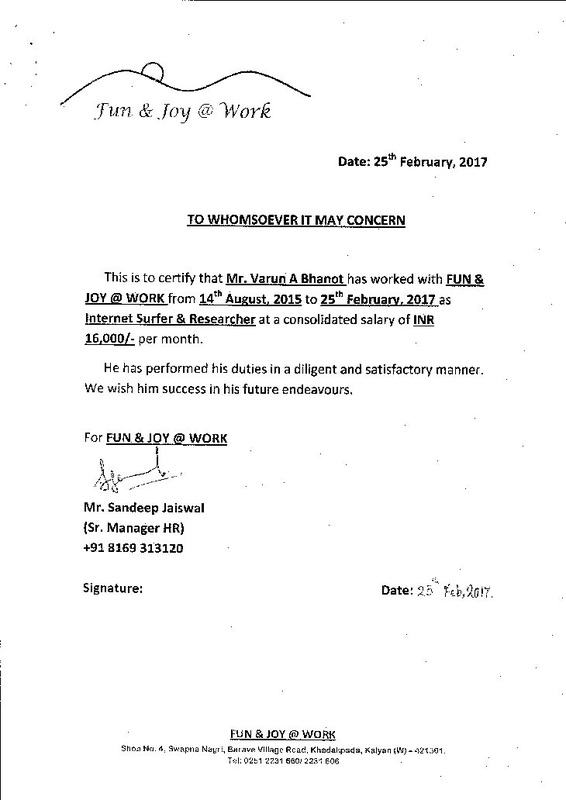 His salary at the time of leaving was 16000/- He left suddenly on 10th April 2017 stating that his mother is not well. The organisation chooses a Legal action. 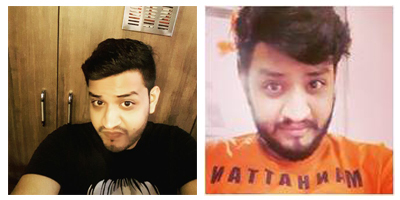 This is to state that Varun A. Bhanot joined the company on 14th August 2015. 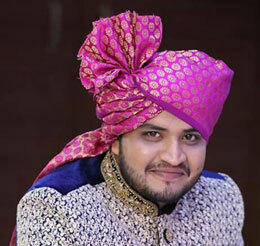 He joined as a internet surfer and Researcher. Varun A. Bhanot has stopped coming to work from 26th February 2017. Neither has he handed over any material or company property which is in his possession. Our communication to him, we have received no response. During the course of his work he was given office cell phones to use; data base and company property "in good faith ". There is breach of trust with regards to use of organisational resources and material. Anyone dealing with him can do so at his own risk and belief. My organisation does not take responsibility for his actions. 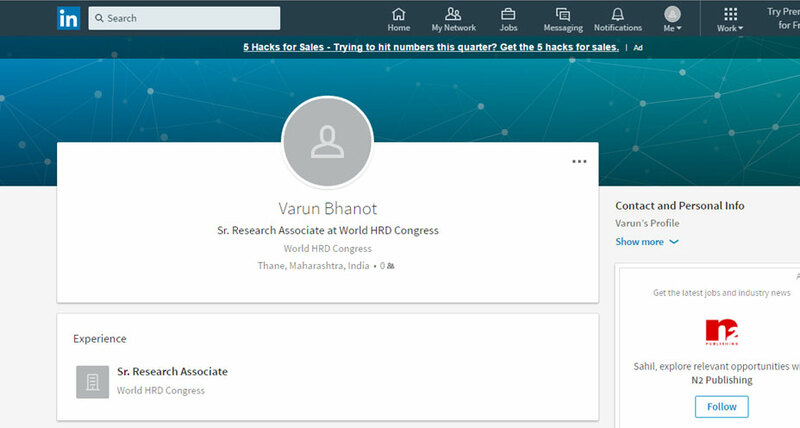 Varun A. Bhanot Linked in Profile as below with regards to job description and work related to World HRD Congress is inaccurate and misleading. 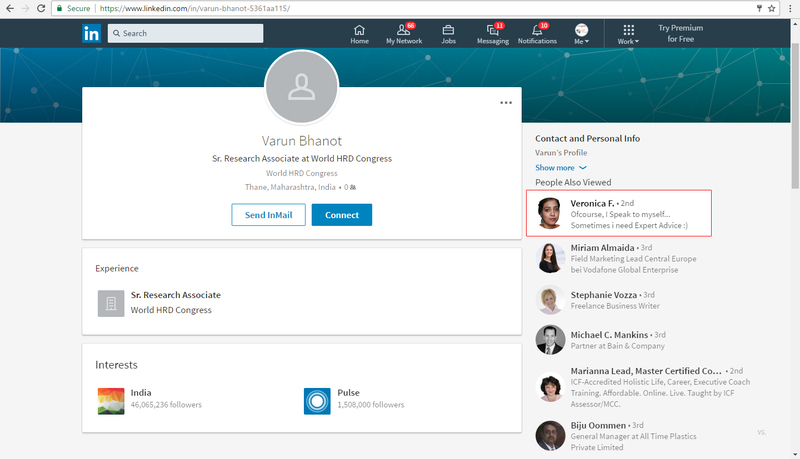 Veronica G. Fernandes Joined on 8th June 2015 and she stopped coming to work from 4th March, 2017. The Organisation approached her to seek clarity on matters related to the business for which she was involved she didn't respond to the said request. 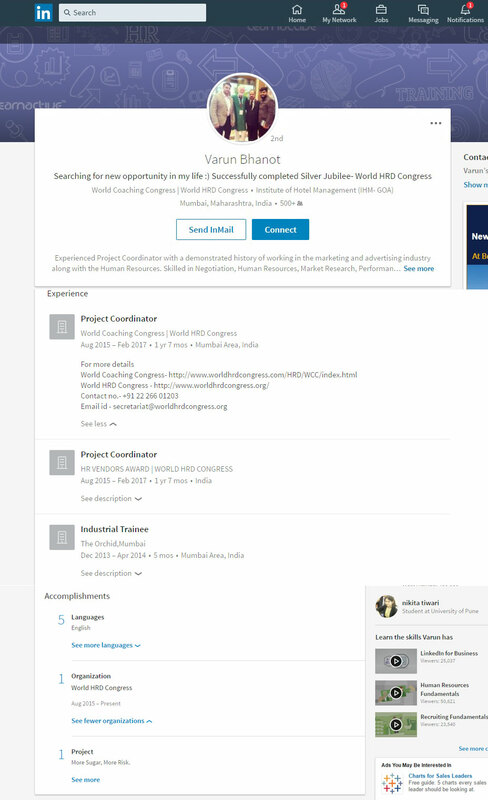 She is in possession of Organisation Data, Material and Allied Stuff which is the Intellectual Property of the organisation. She was involved with the registration of International delegates at the World HRD Congress held in February in Mumbai at the Taj Lands End. No relieving letter has been given neither she has served the terms of employment. The organisation deserves the right to take suitable action to protect its intellectual property as well as the reputation. 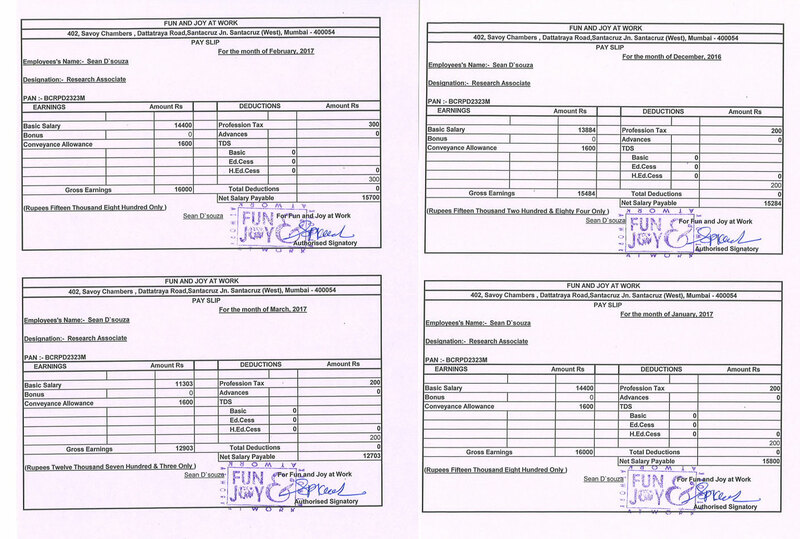 Tejal Navale has robbed the office material like CDs, Files from the organisation. She has defrauded our Organization. Any one dealing With her will do so at his own risk. Attempt to reach her proved futile. Fun and Joy at Work.